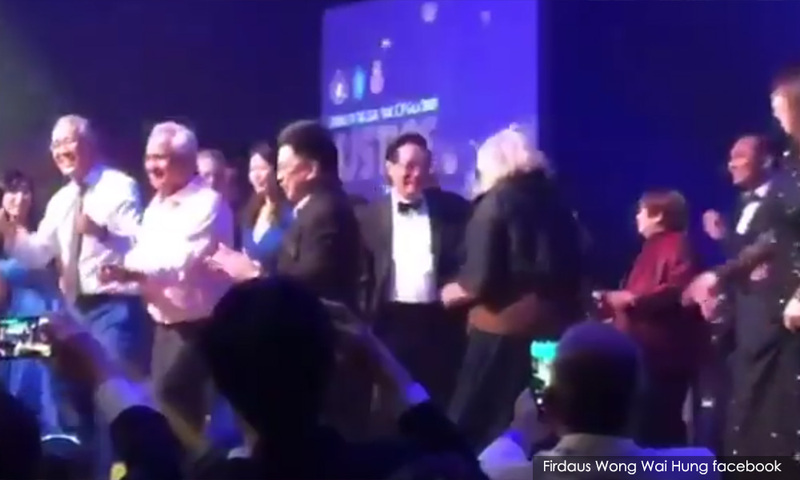 A video of Chief Justice Richard Malanjum and Attorney-General Tommy Thomas dancing to the classic Chubby Checker's 60s hit "Let's Twist Again" during the Opening of the Legal Year 2019 gala dinner on Friday night has some politicians losing their "cool"
The video shows the two of them dancing at the legal gala organised by the Sabah Law Society (SLS) at the Magellan Sutera Resort in Kota Kinabalu, Sabah, on 18 January. The video also shows lawyers Siti Kasim and Ambiga Sreenevasan along with Liew Vui Keong, who is the de facto law minister in the Prime Minister's Department. "The viral video of a dance event involving personalities such as Liew, Malanjum, Thomas and lawyers who are seen as pro-Pakatan Harapan such as Ambiga Sreenevasan and Siti Kasim is an embarrassment to the judicial and legal institutions of this country." The UMNO Youth chief claims that the viral video has damaged the reputation of the judiciary and their conduct breached ethics and raises issues of conflict of interest. Asyraf, who called the dancing an"ethical violation", said﻿ it is not right for the "chief justice and attorney-general to rub shoulders with politicians and high-profile individuals" as "it courts controversy and erodes the people's trust in their decisions." "In 2016, we have questioned then A-G and ministers dancing in a Merdeka event. We have to be consistent," he said in his tweet, insisting that judiciary and executive figures must keep their image of impartiality and the integrity of the institution in official events. A widely-circulated video in 2016 showed a man resembling then A-G Mohd Apandi dancing with BN ministers, including Wan Junaidi Tuanku Jaafar, Salleh Said Keruak, Azalina Othman Said, and Nancy Shukri at the Merdeka Day parade. 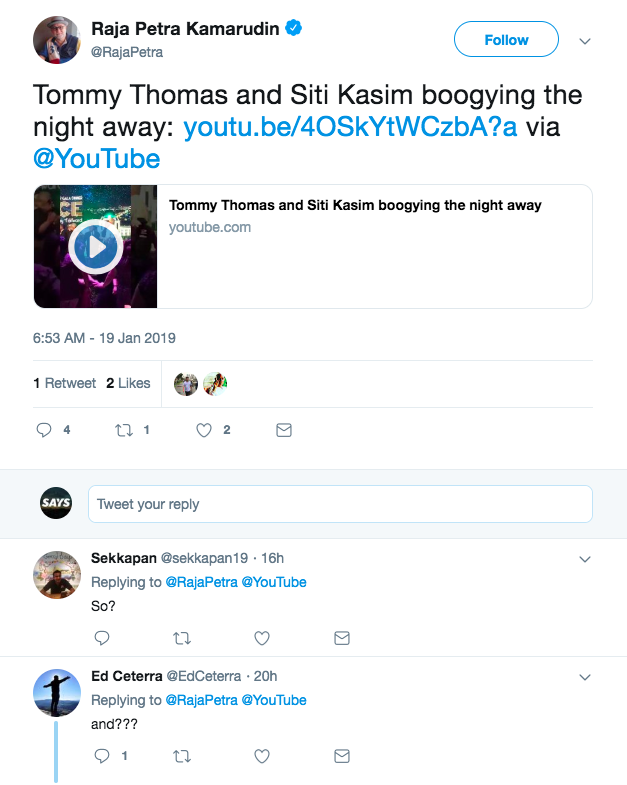 When others questioned Khairy over his "pointless" tweet, the Rembau MP kept repeating the same line saying that while he doesn't have any issue with anyone dancing, he was "just trying to remember what PH said before when this happened﻿." It's tradition. So nothing wrong with that. Nothing wrong with YB KJ's tweet too. But it's not fair for tweets saying Tommy Thomas' dancing is an act unbecoming of an AG. I am pro BN but i complaint when the need arise. Not on trivial matter like dancing in an official function. I didn’t have an issue with it. I don’t have an issue with this. I was just trying to recall what PH’s position was during the previous dance off. Non issue then, non issue now. What was the point of this tweet? Nothing wrong. I’m just trying to remember what PH said before when this happened. Also, there is a Minister there. This is a cheap shot YB. Trying to mislead the people who doesnt know better. Not expecting it coming from you. A Twitter user with handle @blysg02 replied to a tweet by PKR's Nik Nazmi and Nurul Izzah, questioning them how is "dancing to old tunes publicly compromises the perception of independence and integrity of the judiciary? How is it so?" Dancing to old tunes publicly compromises the perception of independence and integrity of the judiciary? How is it so? Why are you guys jumping the guns ahead of PAS? Another user with handle @AnakSdrBakar replied to both of them, saying it's unbelievable how so many MPs are speaking up about something that is a "non-issue". On Facebook, a user said that the A-G and CJ are "dancing after their work hours." "Everyone has a personal life and it's their personal right after that. What's so wrong with it? They didn't dance publicly at the roadside but did so in a closed environment. What's so wrong... Fools? ", Ameen added while commenting on a Malaysiakini article. Ameen's sentiment and views with echoed by other users on Facebook. "What's wrong if they do the twist? It's better than stealing and robbing the rakyat's money and twist and turn around the story," commented a user named Normah Ibrahim. "What's the problem with them dancing in the video? Are you saying that the judiciary and cabinet staff can't take time off after work and participate in any social activities (eg. : annual dinner, events, etc)?" Daniel Liew, another user, commented. Meanwhile, user Indira Naidu asked, "What kind of mentality this person - who is complaining - has?" She added that "Dancing is not a crime." The clip, uploaded on Facebook, has gone viral. The urban settlement returned to its old name 'Kampung Kerinchi' on Saturday.